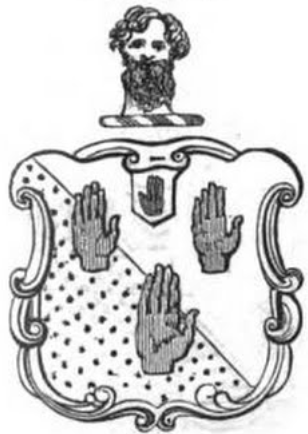 The family of ADAIR was settled in Scotland, and later in Ulster, for many generations, and, according to tradition, derived its descent from a junior branch of the noble house of FitzGerald, Earls of Desmond. WILLIAM ADAIR, who acquired the estate of Ballymena, County Antrim. SIR ROBERT ADAIR, who received the honour of knighthood from CHARLES I, died in 1665. SIR ROBERT ADAIR, of Kinhilt and Ballymena, who raised a regiment of foot and a troop of horse for the service of WILLIAM III, and received the honour of knighthood from that monarch on the field after the battle of the Boyne. ROBERT SHAFTO ADAIR (1786-1869), of Flixton Hall, Suffolk, and Ballymena, County Antrim, who wedded, in 1810, Elizabeth Maria, daughter of the Rev James Strode, of Berkhamstead, Hertfordshire. Mr Adair was created a baronet in 1838, denominated of Flixton Hall, Suffolk. SIR ROBERT ALEXANDER SHAFTO ADAIR (1811-86), 2nd Baronet, of Ballymena Castle, married Theodosia, daughter of General the Hon Robert Meade, second son of John, Earl of Clanwilliam; sometime MP for Cambridge. Sir Robert was elevated to the peerage, in 1873, in the dignity of BARON WAVENEY, of South Elmham, Suffolk. In 1865, Adair began the construction in the demesne of Ballymena Castle, a substantial family residence in the Scottish baronial style. The castle was not completed until 1887, and was demolished in 1957 after having lain empty for some years and being vandalised; the site is now a car park. In 1870, Adair donated a People's Park to Ballymena, engaging fifty labourers to work for six months landscaping it. Bridget Mary; Juliet Enid; Annabel Violet. Captain Desmond Allan Shafto Adair, born in 1920, died in 1943 at Italy, killed in action. When the 6th Baronet died in 1988 the title became extinct. The Adair family owned extensive estates in Ballymena and have been described as the "founding fathers" of the town. The town is built on land given to the Adair family by CHARLES I in 1626, on the provision that the town held two annual fairs and a free Saturday market in perpetuity. The Adairs were Scottish lairds from Kinhilt in south-western Scotland. The Ballymena estate was temporarily re-named "Kinhilstown" after the Adairs' lands in Scotland. The original castle of Ballymena was built in the early 17th century, situated to take advantage of an ancient ford over the River Braid. In 1865, Adair began the construction in the demesne of Ballymena Castle, a substantial family residence in the Scottish baronial style. 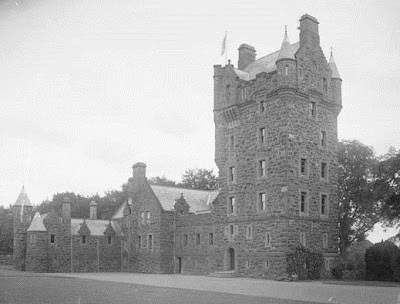 It was a large Scottish-Baronial building to the design of W H Lynn; of rough-hewn ashlar, with a tall tower in the manner of Balmoral Castle. Some of the rooms had stained-glass windows, commemorating various members of the Adair family. The Castle stood high above the Braid River near where the Leisure Centre is today. The Adairs were relatively good landlords and they prospered, as did the growing town of Ballymena. The original Ballymena Castle, built by the Adairs, was burned down in 1720. Work on the Victorian mansion began in 1865 and, by 1887 (as stated earlier) it had been completed and was ready for occupation. 1956 it was declared unsafe and was subsequently demolished. The Adairs owned 6,546 acres in Victorian times. The land for the People's Park was donated in 1870 by Lord Waveney. He financed and planned the landscaping, which took six months. The park is a good example of a public park of that era, which includes maximum variety of areas, through the device of using twisting paths on the undulating ground and strategic planting. There are stout stone walls, round the park (with modern realignment in places); and a shelter belt of Scots pine on the sides of the prevailing winds. The lake, the ‘Park Dam’ was made from an artificially dammed mill pond, half of which was later drained to make a flat area for games. There is a statue, known as the ‘Big Woman in the Park’ of 1872 on top of a hill; ‘Todd’s Hill’; and a notable cast iron drinking fountain of 1909. Many changes have taken place over the years, such as the introduction of tennis courts, a children’s playground, paths and the making and selling off the bowling green. Plans for refurbishment of the park were drawn up in 1997, as former assets had become obsolete or worn out. The individual additions have not, so far, imposed on the original concept of the park. The park-keeper's lodge was designed and built by Lord Waveney. First published in March, 2010. I have Antrim forebears, a family name Clydesdale, who were stonemasons. One, William, had the privilege of a spell in Carrickfergus Gaol in the 1830's for an offence against the Game Laws. I had wondered just how much work there was for them to do. Your blog with the long lists of buildings tells me that they could have been doing quite well at times. Yes, I know, chip off the old block and all that.